Scott Stirling came from down deep in the pack on Saturday night 22nd of March to take out the feature and let everyone know he’s going to be one to watch come Title night! Stirling put down the quickest lap for the night in the feature after the heat races had been run in very heavy track conditions with a time of 15.187 secs at a speed of 94.818kph. Rob Stewart chased home in second followed by another great drive from Chris Paolini who is showing a real liking for the Speedbowl. 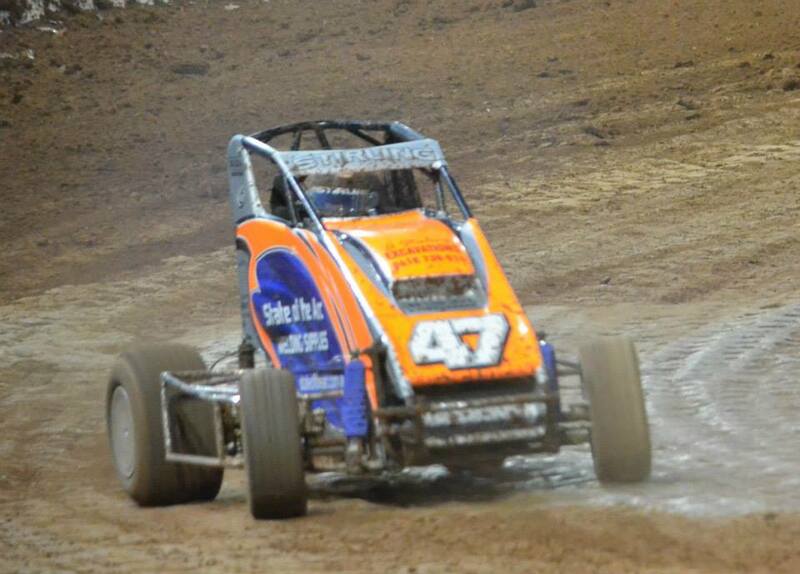 With only one other division racing on Saturday night at the Toowoomba Speedbowl Extravaganza track conditions were always going to be tricky however the first heat caught a lot out with the very heavy conditions. The #37 of Nick Gannon and the Trada Transport #8 of Dave Swan led the field away but it was the #69 of Gary Hudson that was making the big moves and hit the lead on lap 4 and cleared out to win. Chris Paolini was running second only to get run down by Stirling in the last lap and finished a great third. From there back it was hard to tell who was who as the mid pack battle had cars covered in mud and hard to see some numbers! Emma Harris grabbed fourth followed by Dave Collins, Stewart, Gannon, Nick Hudson, Cameron Pesschier, Wayne Corbett, Barry Gibbes and Dave Swan. A quick turnaround time between heats had drivers and crew scrambling to make changes, clean helmets and reload tearoffs and de-mud cars. Paolini and Hudson led them away but was again it was Hudson Snr that led the charge through the field and took the lead as Paolini once again set sail in second after him. Stirling and Corbett also moved through traffic nose to tail as drivers started to get to grips with the track surface. At the line it was Hudson Snr two from two with Paolini second, Stirling nabbing Corbett, Hudson Jnr, Harris, Gibbes, Pesschier, Stewart, Gannon, Collins and Swan. Heat 3 was deja vu as Hudson Snr again took the win from Stirling, Hudson Jnr, Paolini, Stewart, Collins, Gibbes, Harris, Pesschier, Gannon, Corbett and Swan. Feature time and the track had opened out to a good wide surface however not wide enough as the cars roared into turns 1&2 four wide with Collins squeezed up by the fence and having to turn down which unfortunately left Gibbes with nowhere to go but into the side of the #21 and nearly rolling the #66. Fortunately both cars were able to restart but as both cars had stopped on track they were sent rear of field. Gannon led the field away at the restart which had only gone a lap when the next caution came out for Hudson Snr who was parked in turn 3 with damage after clipping Swan. Hudson’s fast night had come to an end. Again Gannon led the field away but Stirling was carving his way through and hit the lead on lap 4 as Paolini and Gannon had a great battle going! Stewart was quietly moving through the field picking cars off as he could but the boys at the front weren’t making it easy as they were on the gas. Corbett, Pesschier, Harris and Gibbes were nose to tail in the pack proving just how even this division is now as they tried to get the better of each other. At the line tho it was Stirling who was too good ahead of Stewart, Paolini, Gannon, Hudson Jnr, Corbett, Harris, Pesschier, Gibbes, Collins and Swan. Hudson Snr did not finish. With 3 ‘B’ grade drivers filling spots in the top 5 it proves the gap between A and B grade is next to nothing when everyones on the gas!! The next meeting is April 5 at Archerfield Speedway for the Paul Messer Memorial a great tribute night to one of our lost members. Its also the last run before its time to get serious for the Qld and Aussie Titles. To all drivers if you haven’t got your nominations in for the Title events yet its time to get them organised! !